This new eco-house provides a flexible home for three generations of the same family. Nestled on a neglected backland plot, the design transforms the site to provide an energy efficient home and garden that will evolve over time with the changing needs of the residents. 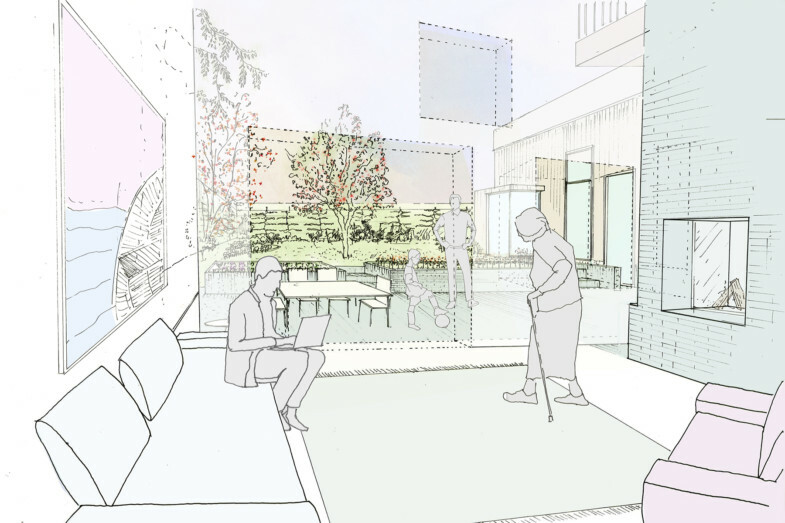 Situated within the broader context of a national housing shortage and an ageing population, this form of multigenerational living is becoming increasingly important across the UK. 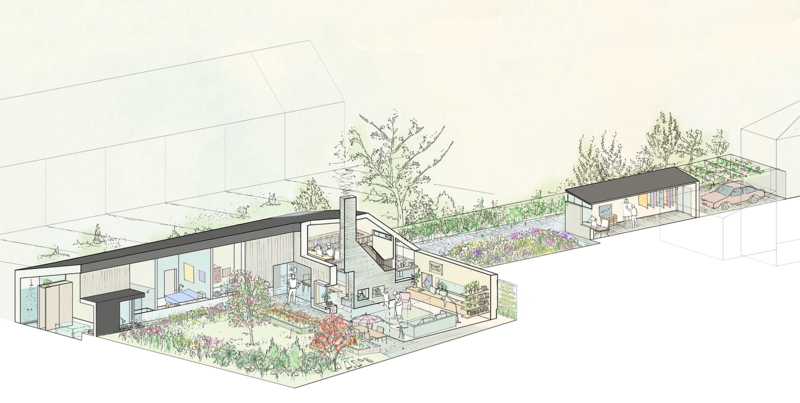 The proposal sits on a neglected backland plot in suburban north London that was occupied by a dairy farm until the early 20th century. The house has been conceived as a pair of pavilions, a reference to the outbuildings and stores that make up traditional agricultural buildings. A greenhouse is the only existing structure remaining from this era. We have reincarnated this as a light-filled lobby that unites the two pavilions.The position and massing of the different parts of the house draw on the site’s unique qualities and respond to existing trees to create a home centred around the garden. 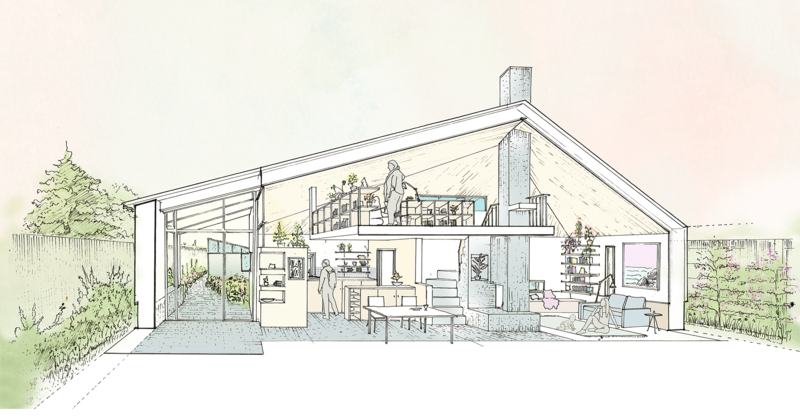 The dwelling has been designed and sized to adapt as the family’s needs and living patterns change over time. It projects beyond the short-term requirements of the occupants by incorporating planning for the future in the present. Arranged across one level, it ensures ease of access for all family members. The L-shaped plan encourages visual connections between the different parts of the home. An open plan kitchen/dining/living space is expressed as the main pavilion and provides space where the whole family can come together around a central hearth. This contrasts to spaces for each individual, from window seats to a reading nook, and the more private bedroom wing. 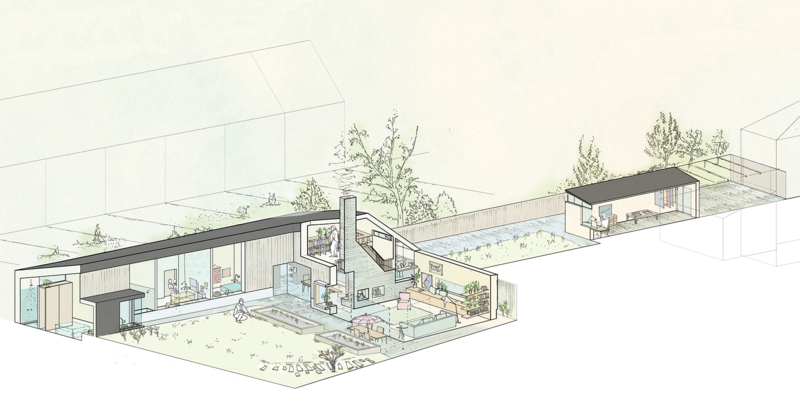 The series of cut-away drawings shown above illustrates how the spaces can adapt and change as the family develops over the next year, five years, and then fifteen years. 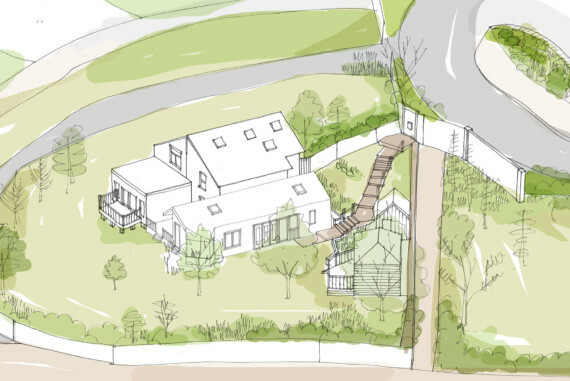 The clients are keen gardeners and want to have a positive impact on the land; from using sustainable building materials and growing their own food, to promoting biodiversity on the site and creating a habitat for local wildlife. Inside, carefully placed openings bring a gentle breeze, scents of the garden and natural light into the home. It is designed to be long lasting, low impact, and energy-efficient. Passive sustainable design principles inform the design to reduce heat loss and take advantage of solar gains; Passivhaus PHPP modelling was used to test energy performance. The building fabric is highly airtight and energy efficient with the main structure being made of prefabricated timber cassettes. The garden frontage is clad in timber, whose warm colour will weather to a subtle grey to blend with the surrounding trees and fences. 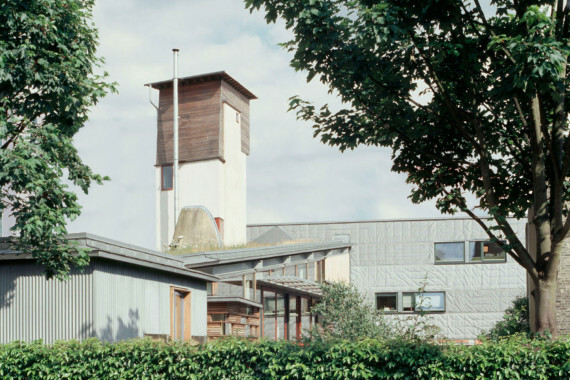 A short film about three of our residential projects.